Something you may not know about me is that I'm big on anniversaries and commemoration. For example, I can tell you the precise moment as well as the circumstances surrounding the transition of those people in my life who have moved from acquaintance category to the friend category--our friendiversary if you will. And I will remind my friends of this every year on that date, sometimes forcing them to have dinner with me, or even toast to the occasion. What's interesting about this (other than the fact that said friends put up with such behavior) is that I'm not a numbers person. In fact, math class was the bane of my existence for most of my childhood. Well, that and raisins. Anyway, this week is the anniversary of this blog--it's been one year since my very first post. This time last year I was packing for a trip to Australia. And tonight I'm packing again (yes, the Cabin Cuddler will come along)...for a visit to my sister's house in Atlanta where I'll be spending Christmas with her and my parents. And don't think for a second that I won't "commemorate" events of family Christmases past...like the time my sister (she'd take me down if I wrote about that). 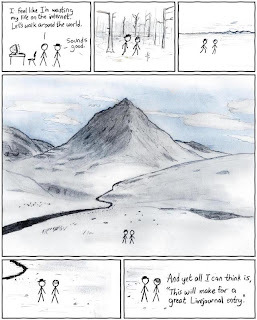 Despite the violent protests from the hometown crew (they find blogging to be painfully self-obsessed and pointless-see above cartoon), I completed a year's worth of entries about ME and MY LIFE. And since there will be all sorts of things for me to continue telling them about ME in 2008, I plan to keep the posts comin'. Perhaps I'll write about each of our friendiversaries! Shall I, Dougie? It's a good thing that we didn't exhaust ourselves with too many superstores in The O.C. since this past weekend may have set a new record for action packing (Verd, please copyright this verb for me). It began with a formal holiday party on Friday night where one of the hosts, Jason, (also featured here as a pig skin aficionado), dressed up as Santa Claus. Not only did jubilant guests clad in their holiday finest get to sit on his lap and register gift requests, but each of us actually received a present from the big man in red--right there! All you had to do was contribute something to his pile of goodies earlier in the night and then you got one back when it was your turn to hop on board. The best part about it was that by the time it was your turn to lap sit, you had forgotten all about the item you gave away (4 adorable finger puppets made of Peruvian alpaca). This way, you could focus on your brand new present (a giant blue salad bowl). Pure genius, I tell you. The next morning I woke up, adorned myself in Santa-inspired attire and headed out for a Bridesmaid Dress Summit hosted by Ms. Dayle, the bride-to-be (details = spared). While it would have been nice to dress up in a cute little brunch outfit like the other bridesmaids, I had no choice but to wear a red felt Santa hat and a puffy white jacket as I would be headed directly to the Santa Pub Crawl Conference ("SantaCon") immediately afterwards. If you don't yet know about SantaCon, read up on it here. Basically, it's a city-wide pub crawl open to the public where all participants dress up as Santa. Hundreds and hundreds of people hit the streets in celebration of the holiday season. And, oh, do they celebrate. The best part about it is looking around and seeing a sea of red velvet and fluffy white trims filling bars, stopping traffic and confusing San Francisco tourists from around the world. There were big Santas and little Santas, boy Santas and girl Santas...and even gangsta Santas. 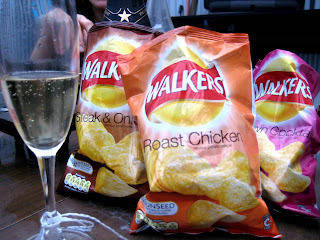 The weekend wrapped up with a dim sum breakfast followed by a champagne and potato chip house party (see pic below). And, yes, the party was as fun as it sounds. The host is a wine writer when not busy with his "other" job working as an attorney for punk rock bands (I know!). So, he naturally has all sorts of champagne lying around that we got to test drive. But even more exciting than the dizzying assortment of bubbly was the new method I learned for opening champagne bottles: knocking out the cork with the dull side of a chopping knife. I don't think I've ever felt as powerful as I did when I slid that knife up the chilled bottle directly along the glass seam and successfully chipped off the lip of the bottle setting the cork in motion as that indistinguishable "pop" sent onlookers into drunken cheers. That may be the closest I ever get to Axl Rose style partying, although a girl can always dream. Remember how my friend Heb moved to L.A? Well, that wasn't entirely true. We pretended that's what was happening for a little while but Truth stared us squarely in eyes once it came time for me to buy my first plane ticket to visit her and James in their new home. There was no denying the reality that LAX would not be my travel destination. Nope, I'd be landing at John Wayne Airport in Orange County. We both find it endlessly humorous that Heb now lives in The O.C. While I was visiting, comments such as "Hey, what do you want to do tomorrow? We could always check out any one of the THREE Targets within walking distance from my house," sent us into fits of giggles despite their disturbing accuracy. While it's true that one can be overwhelmed by the endless collections of strip malls and the sheer number of criss-crossing six-lane highways, The O.C. is by no means devoid of endearing gems. Exhibit A: This charming beach restaurant we went to for a Saturday brunch. To get there, we took a walk along a small village of bungalows just feet away from the water, arriving at the sandy hostess podium slightly winded, with our jeans rolled up ever-so-casually. "Table for two, please." "Oh, sure, we'd love an ocean view. Thank you..."
This quirky little establishment seemed to be stuck in the 1940s with music and mood to further set the scene…and there wasn't a Target in sight. One of many exciting things about this place was that every chair had a blanket folded over its back--in any one of several colors, depending on where the hostess decided to seat you. So if a crisp breeze were to come in off the ocean while you were enjoying your breakfast, not to worry. Rather than endure a chill, simply wrap yourself in a a red, blue, green or perhaps an orange blanket, take a sip of mimosa, breathe in the fresh, salty air and continue onward and upward with your organic omelet. Cheers! Exhibit B: The Rose Bowl Swap Meet. First of all, do you know the term "swap meet" (not to be confused with swap meat)? I didn't....until I went to The O.C. Apparently, it's another way to say flea market, California style. Vocabulary aside, it was the best shopping experience I've had in a very long time. Between the two of us, we walked away with a pair of hand-sewn pillow cases, a delicate little necklace, a hand-made glass chandelier, a stylie sundress with subtle Asian flair, a set of sage green plates proudly displaying a "Made in California" imprint on the back, two soy candles smelling of rose and eggnog respectively and a pair of big, gold earrings in the shape of leaves that look way cooler than they sound...especially when Heb wears them. Exhibit C: The sky is sunny and blue with puffy little white clouds! Rumor has it the reason for this is that the Santa Anna mountain range blocks the L.A. smog. This keeps the skies of The O.C. clear and bright creating the perfect conditions for Heb to take note of plastic surgery recipients while cruising the strip malls. Some people are afraid of snakes and some people fear bugs and some are in a constant state of panic about imminent natural disasters like tsunamis and earthquakes. While falling into a pit of hissing snakes or having an army of angry ants crawl all over me or being trapped under heaps of earthquake rubble aren't particularly appealing thoughts, I could certainly think of worse plights. Aside from an over-dramatic reaction to the sight and even the thought of worms (ew, ew, ew) and an irrational fear of this one horror movie character that's been plaguing me since 6th grade (yes, I'm still too scared to even type this character's name), I find nothing more terrifying than a big, gray, toothy SHARK. Perhaps this fear is somehow related to my poor swimming skills, not that I could out swim a shark if I had a stronger, more consistent breast stroke. Or maybe it comes from the fact that my dad watched Jaws at least once a year (sometimes the complete trilogy) throughout my impressionable childhood years, beckoning me to sit with him for "just one more scene"--which usually wound up being the "boring part" where the manly sea fisherman, the shaggy-haired researcher and the sensible police chief compare battle scars and talk about the USS Indianapolis tragedy over shots of whisky as that clever sea monster begins to attack their boat from below (note: I no longer find this scene boring). Or possibly, it has something to do with the "Jaws attack" that happened at the Universal Studios boat/tram tour that my family took while on vacation one year. I remember being scared out of my 11-year-old mind when the mechanical great white jumped along the side of the boat. 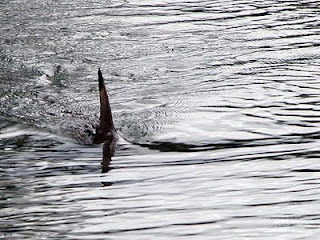 Yes, we all knew it was coming (my dad warned me more than once), and yes, I knew that sharks didn't live in California amusement park lakes, but at that moment when the fake shark leaped into the air, I was SURE I'd be his next victim. For this reason, I forbid myself from watching all shark-related movies, which is particularly necessary now that I live near the ocean, an ocean with SHARKS right off its shores. The last thing anybody wants is some hysterical girl screaming like crazy every time a surfer falls off his board. And for a while, it worked. I even got myself to go scuba diving in Australia in waters where sharks are known to hang out. It was on this excursion that I learned about the story of the abandoned divers who were supposedly eaten by sharks--the story upon which the movie Open Water was based. Just shy of a year later, I finally got up the courage to see the movie. My first mistake, other than breaking the no shark movies rule, was watching it alone, late at night. I know better than that--much better. My second mistake was not turning it off as soon as I found myself in a state of sheer panic, jumping at every little sound coming from the street below (considering I live above an Irish pub, there was a serious amount of jumping going on). Unfortunately, I got through the whole thing and somehow fell asleep not long after the disappointing yet horrific final scene. Sure enough, I found myself awake at 3 am after a particularly terrifying shark nightmare, or sharkmare as I prefer to call them. I fell back to sleep and...more sharkmares. It's now been 4 days since I saw the movie, and I'm still thinking about sharks--as in all the time. The interesting part about this particular fear is that there's simply no chance that a shark is going to get me any time soon as I plan to remain safely on land. At least if my fear were related to, say, MRSA (the scary, contagious kind) or gang-related violence, I'd kind of have a point. But nope, what's keeping me up at night (literally) is my fear of a great white shark attacking me anywhere between my home in the Mission and my office located downtown on the 8th floor of a big building. I may only be half Jewish, but I am in full support of fun menorahs. I wonder if the "Selection of Fruit" menorah comes with that exciting pink wallpaper. 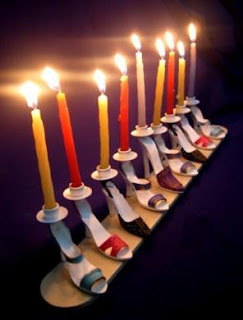 And I wonder if the "Stylish Shoes" menorah will be updated next year to include those furry snow boots that everyone seems to be wearing this season. I kind of hope so. I think it would make a nice Shamash. Please let me know if you come across an "Animals of the Arctic" menorah as I could not imagine a theme that would make me more enthusiastic about Hannukah. I can think of few things that might get one more in the holiday spirit than lighting a candle held by a sweet baby penguin or perhaps a blubbery little seal.